Today, I’m excited to announce the brand new feature to the world’s most accurate Amazon FBA sales estimation tool, the Jungle Scout Chrome Extension. Our team of developers, designers, and data scientists took your requests and added in what you wanted to see. What’s the Jungle Scout Chrome Extension? The Jungle Scout Chrome Extension is an application that integrates directly into your Google Chrome Browser. When you open the application on an Amazon search results page (the page you see when you type something into the search bar and product ideas come up), the Chrome Extension offers you a real-time snapshot of important sales data such as Average Monthly Sales, Best Sellers Rank, Review Counts, and more. Learn more about the Jungle Scout Chrome Extension by clicking the button below. What’s New with the Jungle Scout Chrome Extension? I want to take a quick moment to point out that we’ve added a brand new column to the Jungle Scout Chrome Extension: Daily Sales Estimation (labeled A19 on the graphic below)! What is the difference between Daily Sales Estimation and Monthly Sales Estimation? Whereas monthly sales estimates are an aggregate of the past 30 days of sales which are calculated daily and added together, the daily sales estimate is a snapshot based on what the respective product has sold that day based on its current Best Sellers Rank. What other features of the Jungle Scout Chrome Extension should I know about? If this is the first time you’ve seen the Chrome Extension broken out like this, you’re in luck. I’m going to show you exactly how each and every one of the many features that the Jungle Scout Chrome Extension comes with can help you find the perfect product to sell on Amazon FBA. Most folks never use more than the dashboard (the parts labeled ‘A’) to find profitable products. And you can do that, too! I just wanted to make sure that you know every single thing that the Chrome Extension can do. It truly is the best, all-in-one Amazon FBA product research tool, verifier, and finder in the world. A1 – Filter menu access. Click this to access the filters menu (labeled ‘B’). A2 – Extension type badge. The Jungle Scout Chrome Extension comes with two packages: Standard and Pro. 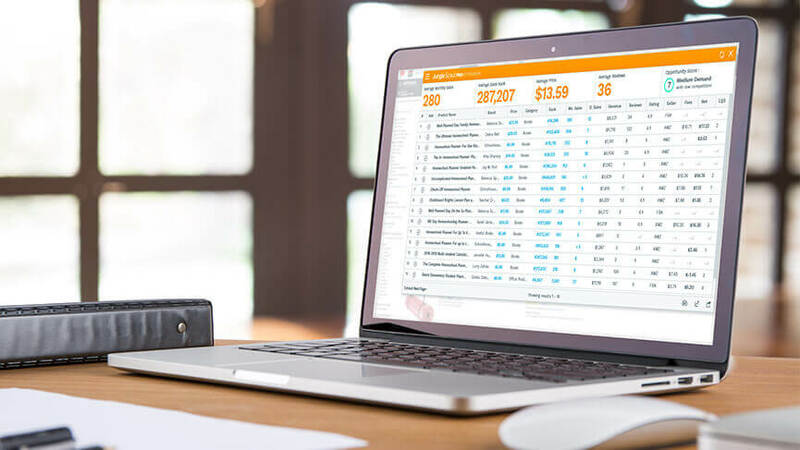 Pro offers a few more features than Standard such as the Opportunity Score, Historical Average Sales, and more. You can learn more about the differences between the two by clicking here: The Jungle Scout Chrome Extension. A3 – Refresh button. When you perform a new search on Amazon or you want to go back to the default results, click this button to refresh the data. A4 – Average monthly sales. This lets you know the average sales for all of the products currently listed in the Chrome Extension. A5 – Average sales rank. This is the average Amazon Best Sellers Rank for all of the products currently listed in the Chrome Extension. A6 – Average price. This is the average Buy-Box price for all of the products currently listed in the Chrome Extension. A7 – Average reviews. This is the average review count for all of the products currently listed in the Chrome Extension. A8 – Opportunity score. This is our own ranking that we award the products currently listed in the Chrome Extension. The score is a range from 0 (very poor) to 10 (the best), which can help guide you in the product selection process. A9 – Extract next page button. This button lets you enter the next search page of products into the Chrome Extension. Once loaded, the Chrome Extension will recalculate its new values automatically. This is a Jungle Scout exclusive feature! A10 – Results. This tally lets you know how many product results are currently listed in the Chrome Extension. A11 – Ranking. This is the product’s current position on the Amazon search results page that you used the Chrome Extension to investigate. A12 – Add to Tracker. The buttons that look like plus signs are what you use to instantly add a selected product to your Jungle Scout product tracker. A13 – Product Name. This is the name of the product as it appears in the product listing’s title/headline. A14 – Brand. This is the name of the product’s brand (not to be confused with the seller of the product itself). A15 – Price. This is the product’s current Buy Box price. A16 – Category. This is the department that the product shows up in inside Amazon’s product database. A17 – Rank. This is the current Best Sellers Rank (BSR) for the product. A19 – Estimated Daily Sales. This is the daily sales estimate is a snapshot based on what the respective product has sold that day based on its current Best Sellers Rank. A20 – Revenue. This is the estimated total revenue the product produced in the last 30 days. A21 – Reviews. This is the total number of reviews for the product. A22 – Rating. This is the average rating for the product based on its reviews. A23 – Seller. This informs you whether the current Buy Box holder is a Fulfilled-By-Amazon (FBA) seller, Fulfilled-By-Merchant (FBM) seller, or Amazon (AMZ) itself. A24 – Net. This is the estimated net profit (before removing cost-of-goods sold and taxes) for the product. A25 – Listing Quality Score (LQS). The listing quality score is an algorithm we created to rate the page’s product listing optimization quality based on images, description, title, and other key factors. A26 – Sponsored Listing Badge (SP). If a product is a sponsored listing (its position paid for with advertising), it will have a gray “SP” next to its name. B1 – Profile Information. Here you can store your profile information including a personalized photo, your name, and your email address. B2 – Columns Filters. Need more options on your Jungle Scout Chrome Extension dashboard? You can add additional columns such as fees, tiers, number of sellers, product dimensions, and product weight. Additionally, you can access the Jungle Scout Knowledge Base, contact seller support, or log out. B3 – Help & Support Page. If you have a problem or find a bug, you can click the ‘?’ to contact our support staff. B4 – Filter Results. If you wish to sort the Chrome Extension’s results to better fit your criteria, you can do so by entering information into the boxes. B5 – Buy Box Seller Filters. In addition, you can take out listings from certain seller types (FBA, FBM, or AMZ). B6 – Size Tier. And if you wish to remove products of a particular size, you can click on the boxes to remove them (Standard or Oversize). If you wish to see the historical price of a product, click on the blue dollar amount in the product’s price column. This opens a modal pop-up that will show you how the product’s price has fluctuated over the last year. If you wish to see the historical Amazon Best Sellers Rank of a product, click on the blue number in the product’s BSR column. This opens a modal pop-up that will show you how the product’s Amazon Best Sellers Rank has fluctuated over the last year. If you wish to see how the historical Monthly Sales Estimation of a product, click on the blue number in the product’s Mo. Sales column. This opens a modal pop-up that will show you how the product’s Monthly Sales Estimations have fluctuated over the last year. If you wish to see how the historical Daily Sales Estimation of a product, click on the blue number in the product’s D. Sales column. This opens a modal pop-up that will show you how the product’s Daily Sales Estimations have fluctuated over the last year. To get a good idea of how much you stand to make selling a particular product on Amazon, click on the bold type number in the product’s Net column. This opens a modal pop-up that allows you to enter the cost of goods and price data that you would want. Then, it calculates your estimated net profit. Clicking on the leftmost icon in the bottom right corner of the Jungle Scout Chrome Extension opens the product word cloud modal. This shows the frequency of certain words as they appear in the product listings for the search results. Clicking on the center icon in the bottom right corner of the Jungle Scout Chrome Extension opens the Google Trends Analysis on a separate tab. This shows the frequency of searches related to the respective search term for the current Amazon search page results you are viewing with your Jungle Scout Chrome Extension. Clicking on the rightmost icon in the bottom right corner of the Jungle Scout Chrome Extension opens the Export / Share modal. This offers you three methods of downloading or sharing your data. Those methods are: share on Facebook, where it will automatically remove the product names, brand names, and relevant categories so you don’t give away your niche; download screenshot, which again removes product names, brand names, and categories; and finally, a CSV file so you can view the information in Microsoft Excel or Google Sheets. If you open the Export Share Modal and click on the ‘Download CSV File’, it creates a spreadsheet document which you can save, edit, and review in Microsoft Excel or Google Sheets. When you share your Chrome Extension findings on Facebook or simply download a screenshot, the Jungle Scout Chrome Extension automatically removes your top secret data such as product names, brand names, and categories. This can help you share your information and get feedback on it without giving away what you plan on selling. If you’re already a Chrome Extension user, either you’ve learned a lot, or I’ve just reaffirmed what you already know: the Jungle Scout Chrome Extension is awesome! And if you’re brand new to all of this, don’t worry. Go ahead and get started now with the Chrome Extension. I think you’ll be blown away by how easy it is to use, and how quickly it can help you find your next million dollar Amazon FBA product. This new future will work in both Pro and Lite ? ?